26 year old new mom Kristina fought hard to find out what was wrong with her chronically ill newborn son Lucas. He was finally diagnosed with Mast Cell Activation Disorder, a disease that rendered him allergic to practically everything – including water. 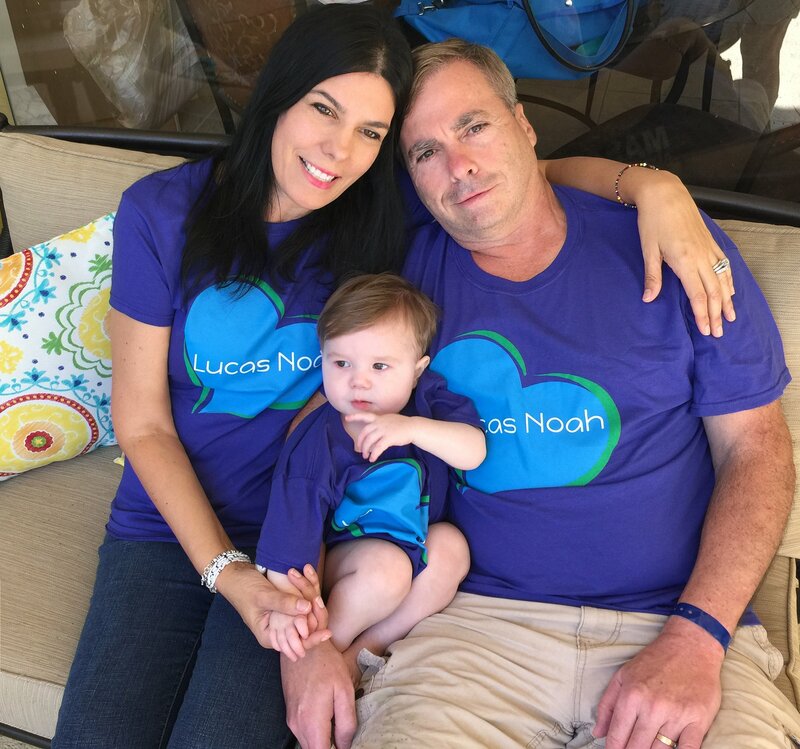 Lucas was being sustained by his mother’s breast milk; Kristina was on an 8-month diet of basically only eating 1 food that Lucas could tolerate. She was exhausted, malnourished, and battling her own newly activated Mast Cell Activation Disorder coupled with Ehlers-Danlos Syndrome. Then the unimaginable happened after a 3-month hospital stay in California where she and her family were seeking treatment for her son Lucas. Kristina suffered a massive brain stem stroke which resulted in her having locked in syndrome, an extremely rare secondary disorder that renders her aware and alert but unable to move, talk, eat, hold or play with her son. That was 20 months ago. Today, Kristina, a physical therapist herself, has been able to prove many doctors wrong. Despite a grim prognosis, she breathes on her own and is making some progress in her PT. While Kristina’s health demands 24/7 care, we are so thankful that Lucas’ diagnosis has stabilized due to aggressive medical intervention. For Kristina, communication is attained by spelling the alphabet with eye blinks, where she can turn letters into words and sentences. She has begun using eye gaze software that allows her to text words and audible phrases using her eyes, a screen, and a speaker. It is a tedious process, but allows Kristina to have a voice. Kristina’s medical care is extensive and costly, and now Kristina is home on 24/7 care, the family needs support in raising funds to cover medical costs and assistance as well as making improvements on their home so that Kristina’s care can be better managed and Lucas can spend more quality time with her. Kristina’s mom Linda is her caretaker, by her side day and night. 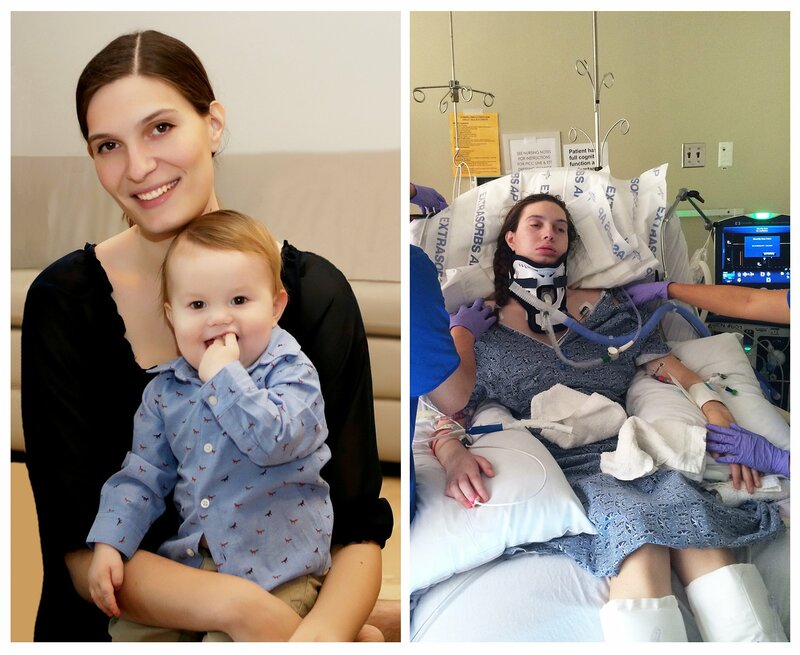 Any money that we raise will go directly to Kristina and Lucas’ ongoing medical care and for therapeutic resources to aid in Kristina’s recovery. One of the biggest blessings in all of this is seeing Kristina’s spirit remain unbroken. She is still the same beautiful woman inside and out, filled with hope and love. She is a remarkable mother. The family really needs your help to continue her journey of recovery. To help offset such expenses, a fundraising campaign in Kristina’s honor has been established with Help Hope Live, a trusted nonprofit organization that has been providing community-based fundraising guidance to patients and their families for more than 30 years. All donations are tax-deductible to the full extent allowed by law, are held by Help Hope Live in the Southeast Catastrophic Illness Fund, and are administered by Help Hope Live for transplant-related expenses only. If you would like to make a contribution, please click the DONATE NOW bar. New Year, new hope! Kristina made some gains in 2017 and it showed us her strength and determination to push more in 2018! We are in awe of her positive attitude and strong will to keep fighting! Kristina has become more mobile and can go on outings to PT, shopping and Church. She is eating some through her mouth and gaining more head and upper body control. Keep fighting Kristina! We love you! The Daly family is so grateful for you. October update! A few weeks ago my daughter Georganne and I visited Kristina and her family in Sarasota Florida. We spent almost a week there caring for and loving on Kristina and her family. We were so happy to be with them! Kristina is making some progress! We are so excited how much God is moving in her life. It takes a village of amazing people to care for her in the loving home of her Mom and Dad. Take a look at the new photos I added of our visit and also the new addition they are building to their home for Kristina. We so much appreciate your support to offset the cost for rehab, medicine, supplies, nurses, PT and the medical needs for Lucas. We also thank you all for your love and prayers! Kristina really needs support in her vital outpatient therapy. Her PT/OT/SPT is what helps her get her movement back. This is so important! Kristina desperately needs to get into a neurological rehab at Sarasota Memorial Hospital to use a Bioness machine – this is for stoke victims and helps activate her nerves and muscles. THIS IS HUGE and can really advance her therapy! A half hour of outpatient therapy alone is $175.00, and insurance will not cover this cost. We ask for support for Kristina to get as much of the therapy she needs to regain her strength and movement to be with her son and family. Thank you! Kristina really needs a new bed!! It is a specialty mattress that will improve her circulation and help prevent sores and aspirations. We also need funds for Kristina’s outpatient physical therapy as well as her neurological occupational therapy. Every amount helps – thank you so much!! I'm always amazed by your progress every time I see you--but really, I shouldn't be, because you're the most determined person I know! Keep up the good work! Kristina- You, your son, your husband, your family, and your medical team are in our prayers! We love you! Bob and I love you!!! May God our healer touch your body today with a miracle!! I love you my Cheen!! Keep up the fight - your progress is an inspiration to us all! Working with Kristina is a blessing. She is so courageous, so fun to work with, she has a great sense of humor even with all what happened to her since the last 2 years. She is a warrior like no body else I have been giving the chance to meet. I thank Kristina and the Brightbill family to welcome me and allow me to work alongside with you all. Laurie Gagné, OTR/L but also and mainly, a friend of the Brightbill family. Our love is so deep for you Kristina that it drives us to pray and be with you in spirit daily. We will strive to find every way possible to help you on this journey to recovery.